Throughout the year I often find myself asking questions about personal “soul care” and this usually turns into questions about my time spent reading Scripture and praying. I used to always feel like I was the worst follower of Jesus in the universe because I really struggled to pray according to the models I had inherited from previous experiences (think Evangelical or Charismatic). That all changed a few years ago when my mom gave me a daily prayer book. It was a huge help because it gave me some guidance in my prayer and devotional time. With this in mind, I’d like to heartily commend Joel L. Watts’ Praying in God’s Theater: Medications on the Book of Revelation (you might know Watts from Unsettled Christianity). Praying in God’s Theater isn’t like most books on Revelation. With the upcoming Left Behind movie, discussions about eschatology will only increase. Yet if you are expecting discussions about the Millennium, Rapture, or Preterism, you’ll be happy to know that Praying in God’s Theater doesn’t cover those topics. Rather, Watts has written a magnificent book on how to use Revelation in your prayer life. What is so beautiful (yes, beautiful) about Praying in God’s Theater is the use of such diverse sources from the numerous Christian traditions. Watts acknowledges his appreciation for these sources early on and the rest of the book simply demonstrates his commitment over and over again. For example, you’ll read reflections from John Wesley, Tertullian, St, John of the Cross, Clement, and much more. And the prayers of Revelation are what tie all of these voices together. It’s very beautiful. Watts’ Praying in God’s Theater is full of theological doxological devotionals, a concept that I find remarkably interesting. In fact, what impressed, and continues to impress me, is how rich this 221 page book is. You can either read and pray through it from start to finish or you could jump around and use it “as the Spirit leads.” Or you can be creative and read it in whatever manner suits your fancy. For my part, I plan to use it this Fall for my devotions with my family. I also plan to encourage a few of my friends who really enjoy Celtic spirituality to pick up a copy and use it along side the Celtic Daily Prayer Book (this is the one I use the most). 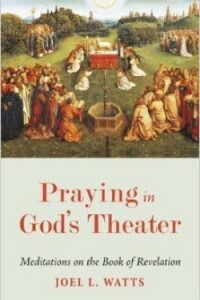 So if you want to thicken your understanding (and use) of Revelation, I’d suggest you pick up Praying in God’s Theater. If you desire a doxological devotional that helps you focus on Jesus, I’d suggest you pick up Praying in God’s Theater. If you long for a way to pray through Scripture that connects you to Christians from the past (and present) in a way that is broad, humble, and united, I’d suggest you pick up Praying in God’s Theater. Watts is to be commended for such a brilliant, helpful, orthodox, doxological, and profoundly engaging tool to deepen one’s prayer life.